Hops (Humulus lupulus ‘Aureus’), in a box of ethanol wash bottles with molecular structures of humulone (left) and isohumulone (right). Beer has been a surprisingly important part of the history of civilisation. Beer has been brewed across the world for thousands of years to provide something safer to drink than dirty water. The alcohol content prevents the growth of microorganisms responsible for disease. Nowadays we have water treatment works to purify drinking water, but thanks to its long history, beer has remained part of our culture. 1. 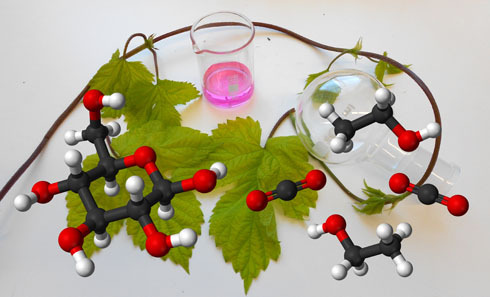 The main picture shows a bine of Humulus lupulus ‘Aureus’ with flowers, draped over a box of ethanol wash bottles, together with the molecular structures of humulone and isohumulone. Cleaning up laboratory glassware is a vital part of conducting safe and productive work in the laboratory, preventing both contamination and unwanted reactions. Solvents other than water may be necessary to remove some compounds, and ethanol, methanol and acetone are often used. Ethanol is the chemical name of drinking alcohol, another key component of beer. The brewing industry is a major part of our economy. Brewers have sought the advice of scientists since the 19th century, as brewing developed from a domestic enterprise into an industrial process. Over the years, we have developed a detailed scientific understanding of brewing. Thanks to this research into the production of beer, we have learnt a great deal about the chemistry of one of its main ingredients: hops. It turns out that hops contain a huge variety of different compounds, some of which have very interesting properties. In fact, the very same chemicals that give beer its flavour may become the medicines of tomorrow. Today, beer is made from dried germinated barley (known as malt), hops, yeast and water. It was not until the Middle Ages that hops started to be added as an ingredient to beer. Hops are the dried cone-shaped flowers of the hop plant, Humulus lupulus. They perform several roles, including clarifying the beer, adding much of the flavour, acting as an antibiotic to preserve the beer, and helping to create the foam. 2. It’s the hops that are mainly responsible for the aroma, flavour and bitterness of beer. So where does the bitter taste actually come from? To understand the answer to this question, we need to know how beer is made. Brewing involves several steps, the most important of which are mashing, boiling and fermenting. During mashing, the starch in malted barley is broken down into sugars by enzymes called amylases, naturally present in the malt. Next, the sugary solution is boiled with hops to remove some of the water and destroy the enzymes. Finally, the solution is cooled and yeast is added to convert the sugars into ethanol (alcohol) and carbon dioxide. Both sugars and starch are carbohydrates, substances composed of carbon, hydrogen and oxygen in a 1:2:1 ratio. Carbohydrates are used by living organisms to store energy and release it on demand. Sugars are small soluble molecules, whereas starch is an insoluble polymer, a long chain of sugar molecules linked together by carbon-oxygen bonds. Starch is broken down to sugars as and when energy is required. The sugars themselves are put through a cascade of biochemical reactions inside an organism to release their energy. When oxygen (O2) is available, sugars are converted to carbon dioxide and water in a process known as respiration. Without a supply of O2, i.e. anaerobic conditions, only products containing the same amount of oxygen as the sugar contains can be generated – this is fermentation. In human skeletal muscles, sugars ferment to lactic acid, causing cramp. In yeast, sugars ferment to ethanol and CO2. Hops flowers contain a family of compounds known as alpha-acids or humulones, which are organic molecules containing a ring of six carbon atoms. When heated, humulones undergo a kind of reaction called an acyloin rearrangement (more about this below). The result is a new family of compounds, the so-called iso–alpha-acids or isohumulones, which contain a smaller ring of only five carbon atoms. During the boiling stage of the brewing process, the high temperature converts humulones to isohumulones and the distinctive bitter flavour of beer develops. Skeletal formulae of humulone and isohumulone, two substances responsible for the bitter taste of beer. 3. Isohumulones have a tendency to react further, often decomposing to other isomers, oxidising or forming polymers. To avoid these problems of instability, some breweries convert isohumulones into more stable compounds. The isohumulones are extracted from hops and hydrogenation is carried out. The stable derivatives that are formed, termed tetrahydroisohumulones, can be stored and later added to the beer until the desired degree of bitterness is reached. Isohumulone (left) can be reduced to tetrahydroisohumulone (right) by hydrogen gas with a solid palladium-on-carbon catalyst suspended in methanol. Alkene groups in the prenyl side chains of isohumulone are reduced to alkanes. While isohumulones are the main source of bitterness in beer, the hops provide a host of other compounds that create a rich depth of aroma and taste that varies from beer to beer. Common aroma molecules found in many flowers and spices are present. More than 150 different fragrant compounds are found in hop oil, ranging from grassy-smelling aldehydes and citrusy esters to floral and fruity geraniol and herbal oxidised sesquiterpenes (J. Inst. Brew. (2011) 117, 259–267). Some of the most important for aroma are the terpenes myrcene, humulene and caryophyllene. Cultivars which are richer in humulene than myrcene have a more pleasant aroma (H.-D. Belitz, W. Grosch, Food Chemistry, 2nd ed., 1999, Springer, p.833). 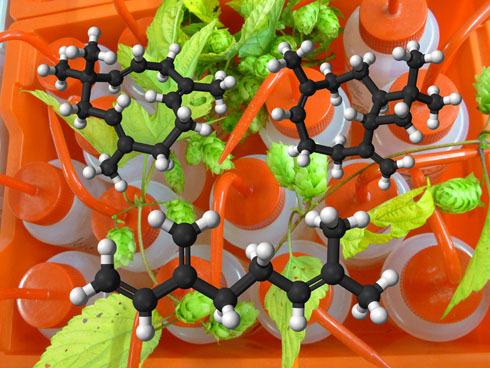 Terpenes are produced by a wide variety of plants, and we have previously blogged on diterpenes in Euphorbias, and terpene derivatives in spearmint. Skeletal formula of the hop terpenes humulene, myrcene and caryophyllene. Hops and ethanol bottles with the fragrant terpenes humulene (top left), caryophyllene (top right), and myrcene (bottom centre). All three are present in hop oil. The base-catalysed mechanism of the acyloin rearrangement of humulones to isohumulones deserves consideration. Only one of several possible tautomers of the humulone starting material (1) will react to give the observed isohumulone product (3). The initial product (2) has only one chiral centre, but undergoes protonation at carbon from either the top or bottom face to form either the cis or trans diastereomer of 3. The final product (3) contains two chiral centres (J. Chem. Soc. (C) (1971) 2412–2415, Angew. Chem. Int. Ed. (2013) 52, 1553–1555). Recently refined proposal for the mechanism of isomerisation of humulone (1) to isohumulone (3) via intermediate (2). Amongst the enormous variety of compounds in beer, several are being investigated in the hope they may be able to help prevent cancer and treat diabetes and inflammation (Eur. J. Cancer (2005) 41, 1941–1954). A class of compounds called prenylflavonoids prevent the growth of cancer cells in laboratory tests. Another molecule, humulone, which is also present in hops before they are boiled in the brewing process, also shows promising anti-cancer properties. 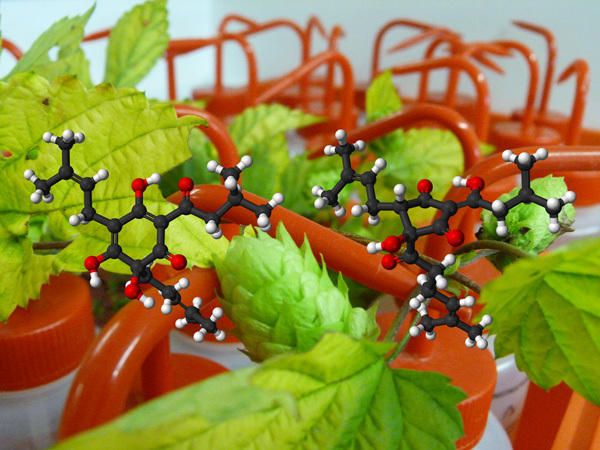 A recent research article published in the journal Angewandte Chemie by American chemists revealed the precise molecular structure of an important hop compound, (–)-humulone (Angew. Chem. Int. Ed. (2013) 52, 1553–1555). Now that the structure is known beyond doubt, scientists should find it much easier to develop medicines based on molecules from hops. If something seems to good to be true, it probably is. For anyone hoping to avoid cancer by heading to the pub, the authors were keen to point out that “excessive beer consumption cannot be recommended to propagate good health”. Contributors – Ben Mills (research, words, images); Becky Hoskins (ideas, editing); Natalie Fey (ideas, editing); Jenny Slaughter (photos). Categories: Alcohol, Plants | Tags: alcohol, chemistry, hops, humulone, medicine, pharmaceutical, science, spices | Permalink.